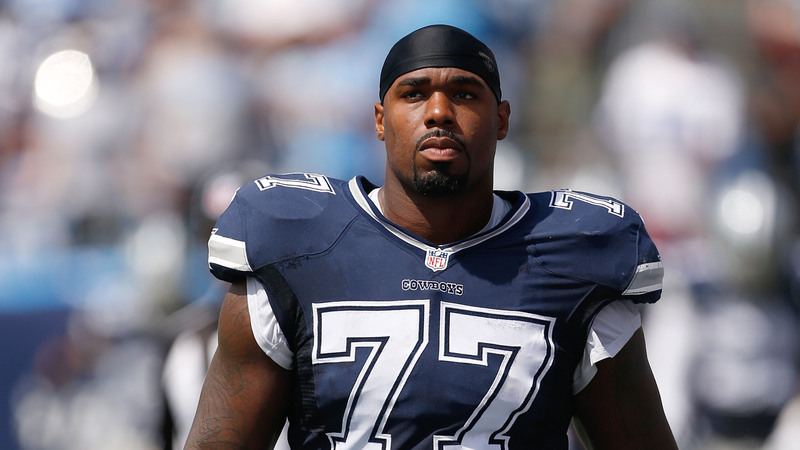 Tyron Smith is a prominent American footballer and one of the best offensive linemen from the West Coast side. He has an excellent athletic strength & body size, that has enabled him to dominate his peers in sports even as a child and afforded him the great opportunity of attending a good school on scholarship. Here’s more on his rise to fame and the issues he has had with his family. He was born as Tyron Jerrar Smith on the 12th of December, 1990 in Los Angeles, California. His biological father was alleged to have been murdered when Tyron was just one year old, and the culprit is currently serving time in the prison. He mother later remarried so that Tyron and his sister spent a lot of their growing up years in a ghetto working in their stepfathers’ cleaning business. They wake as early as 4 am to do morning chores at work before returning home to prepare for school. He attended Rancho Verde High School, situated in Moreno Valley, California and was very active in the school football team playing the offensive and defensive positions. 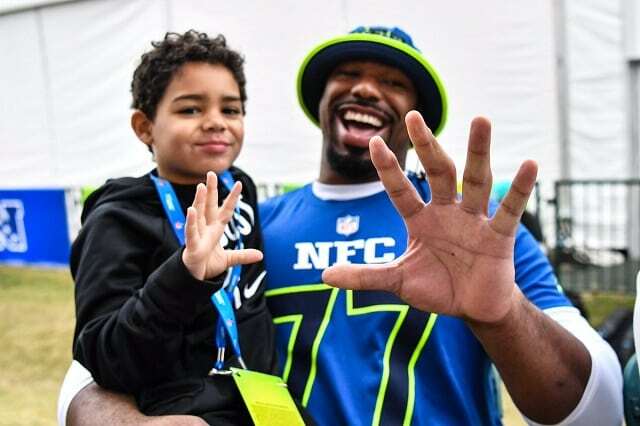 Tyron Smith continued to grow in his career so that at the age of 20, he became the youngest NFL player to be drafted with the shirt number 77 and was named a starter with Doug Free where they both managed the left tackle spot. Later on, his game became more important when offensive linesmen like Marc Colombo, Leonard Davis, Andree Gurode, and Montrae Holland were released by the Cowboys. At the expiration of his original contract, he put pen to paper on an 8-year extension worth, one hundred and nine million US Dollars ($109 million) in 2014. This made him the highest paid offensive lineman in the league as at that time. He started all 16 games which paved way for NFL’s 4th Leading rusher Darren McFadden in 2015 season. Through this, he earned 3rd Pro Bowl selections and was ranked by his fellow players 42nd of the top 100 NFL Players 2016. He helped Ezekiel Elliot become league’s leading rusher in 2016 and was named left tackle for 2016 All-Pro Team which was his fourth Pro Bowl. Moreover, In 2017, he was named fifth consecutive Pro Bowl, alongside Zack Martins (guard) and Travis Fredrick (Center) for the second straight year; but he sustained a lot of injuries which restricted him from playing in the season’s finale against the Eagles. He started the 2018 season on a slow pace loss to the Carolina Panthers in a 16-8 margin, the left wing tackle was sloppy. In the first week alone, Tyron has already picked two penalties for the poor performance, We sincerely hope he will get his acts together just in time for an amazing season. Tyron Smith’s net worth has been estimated to be well over $21.4. His salary and bonuses are also estimated to be a little above $21.1 million with the $0.3 million in endorsement deals. Tyron Smith’s parents are Jerry Lee and Frankie Pinkney who later got divorced. His mother later got remarried to one Roy Pinkney with who she had 5 other children; three girls and two boys. It’s no news that the relationship between Tyron and his family has been on the estranged lane after it came to light that they have been exploiting his fame and are extorting money from him. According to Tyron, he had an agreement with his stepfather to make installment payments for the house they requested he gets for them, which he has finished paying. But the family has not allowed him a moment of peace as they kept coming back for more money after he had earlier settled them. When he refused to be extorted, it degenerated to physical threats to his life and that of his girlfriend. He followed through by filing for a restraining order against his family who had kept showing up while he’s training and during games to demand money. He has said in an interview that he is willing and ready to reconcile with the family if they would quit their parasitic attitude. The hunky dude is not yet married though he has been in two known relationships. Tyron’s current girlfriend Leigh Costa has been his support through his issues with his family and she has also helped improve his dress sense since she came into his life. He was formerly in a relationship with model Lexi Placourakis and they had a son in 2012, whom they named Jaxson. He has maintained a healthy relationship with her after their breakup and is active in the life of his son. He manages to pack as much weight as possible at about 145kg through the consumption of not just junk, but barbecues as well. His other body measurements are 36.3 inches for arm length and 11 inches for hand size. He loves watching movies and series to relax, one of his favorites is the Chevy Chase.